I am in a new position this year. It’s new all the way around: new school, new families, new to the public arena of special education. I was chosen by my principal for the position I took this year. I unexpectedly walked into several messes that were leftover from last year, and because of that, parents have been none too happy in a variety of situations. So I have had to figure out how to smooth things over and create an environment where everyone can put differences aside and move forward into this school year, providing the best care possible for the students who need it. Needless to say, it has been exhausting. I’m all for relationships. I’m not of the belief that I need to have meetings behind parents’ backs so that the ‘school side’ is heavily armed with ammunition to attack the parents. What you see is what you get with me. I dot every ‘I’ and cross every ‘t’ and work as a team with my families. And I believe that I’m pretty strong in the area of diffusing upset parents. I tell them upfront that we are working together and that I want success for their child. 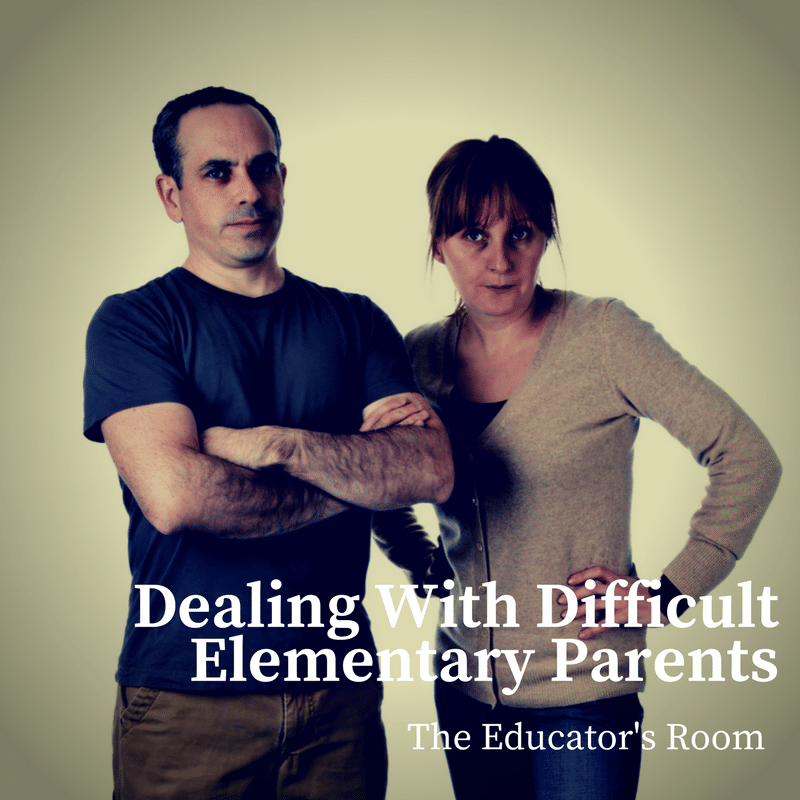 For those of you who have difficult parents that you are working with, here are three things that will help with the struggle. ACKNOWLEDGEMENT – I may be a teacher, but I don’t always have the right answers. And I will be the first to acknowledge this. I’m also a parent and don’t have all the right answers. And when the mama bear in me comes out, everyone needs to be scarce. It’s the same for my parents. Many times parents, especially if they have a struggling child, just want to be acknowledged. A simple “I see you. It’s going to be OK.” I’ve seen so many teachers discredit parents. We do not need to be adding to the amount of negativity that our parents are facing. Tell them that we are going to figure this out TOGETHER. Teachers and parents need to be on the same side in order to create success for kids. GET IT IN WRITING – Big one here, not so that you have something to refer to in order to cover your tail, but so that everyone sees a plan and views that plan the same way. Remember that age-old game of Telephone? Many times our parent conferences are exactly like that. Teachers perceive plans one way, parents perceive them another way. No one is on the same page moving toward a common goal. Write it down so that everything is clarified and understood. REVISIT IDEAS – So everything sounded great during the meeting. A plan was put in place for school and home to help little Susie with her organizational skills or whatever needed addressing. A couple of weeks go by, everyone is following through, but progress is not being made. It’s OK to contact the parents and be frank about the plan not working, or maybe needing a little tweaking. Many times teachers will get the idea of something either being successful or failing, with no shades of gray. We really need to get out of that mode, after all, isn’t that what learning is all about, being able to experience success and learn from failures and build upon what is working? If we see something that might benefit Susie a little bit more, then, by all means, get with the parents and change it up! Don’t let pride (or resentment) get in the way of effectively helping a student. And yes, unfortunately, some parents are just difficult. There is no appeasing them. Thankfully I have run into many more parents who may seem to be difficult on the outside, but once they realize everyone is working together, they let down those walls and true progress can be made for the student. My experience with parents has been more difficult since Trump became president. One wants me fired because he looked at my social media and concluded I was a liberal. Two phone calls to the principal later, I am still teaching, but the stress is unbearable. First, thank you for your service. As an educator we make our society possible. Again thank you for your service. I agree with your article. The article emphasizes listening for understanding and being solution oriented. As a former middle school administrator, I understand and have used your suggestions. I would like to stress the importance of follow through because this is where things typically fail; and when it does, trust and the relationship falters. Before the parent meeting is over, be sure to place at least two dates on your calendar: 1) the two week parent update and 2) the internal progress monitoring date (make sure it is before the 2-week update). Having these dates helps us juggle the myriad of tasks by keeping our eyes on this ball. Also before the meeting is over responsibly delegate the appropriate person(s). That appropriate person is the person you will check in with on the internal progress monitoring date.